This chapter appears in: Vision Models and Applications to Image and Video Processing, C. van den Branden Lambrecht (ed). Because it was not possible to include color plates in the printed chapter, we have provided color versions of a number of the figures here. 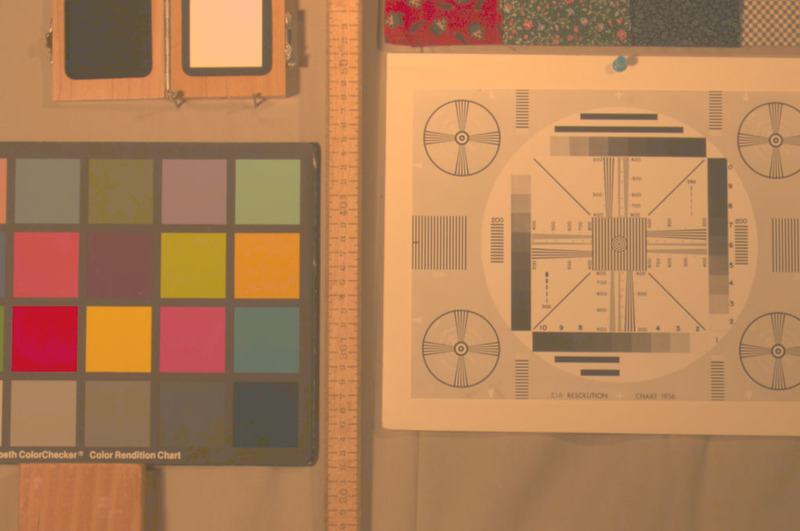 Figure 1.4: This shows a color version the hyperspectral image illustrated in Figure 1.4. At each pixel of the hyperspectral image we computed the LMS cone responses. We then rendered the LMS image using the basic rendering method described in the chapter and calibration data for an Apple 20" color monitor. Fig 1.12: The top image shows a real image obtained with the Kodak DCS-200 color camera. Bilinear interpolation was used to demosaic the image. No color balancing was applied, the RGB camera values are displayed directly. The bottom image is a simulation of the top image obtained from high-resolution hyperspectral data. Fig. 1.14: Color version of Figure 1.14. Supplementary Figure: The two images on the left side show are close ups extracted from the bottom panel of 1.12 above and illustrate mosaicing artifacts. The corrresponding images on the right are for comparison. These were generated by simulating a non-mosaiced version of the DCS-200 camera. Supplementary Figure: The figure shows a pictorial summary of Figure 1.19. 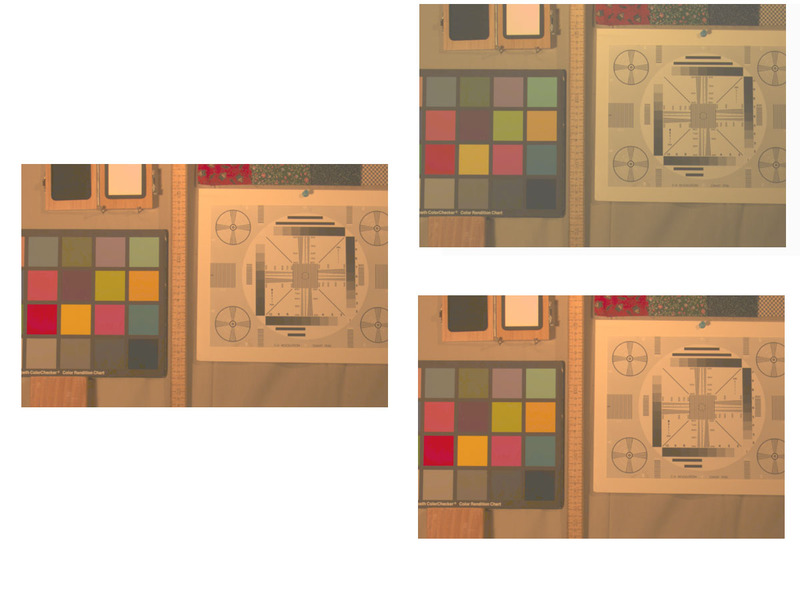 The left panel shows the rendered image obtained (with either method, no noise) when parameter alpha is set to zero. 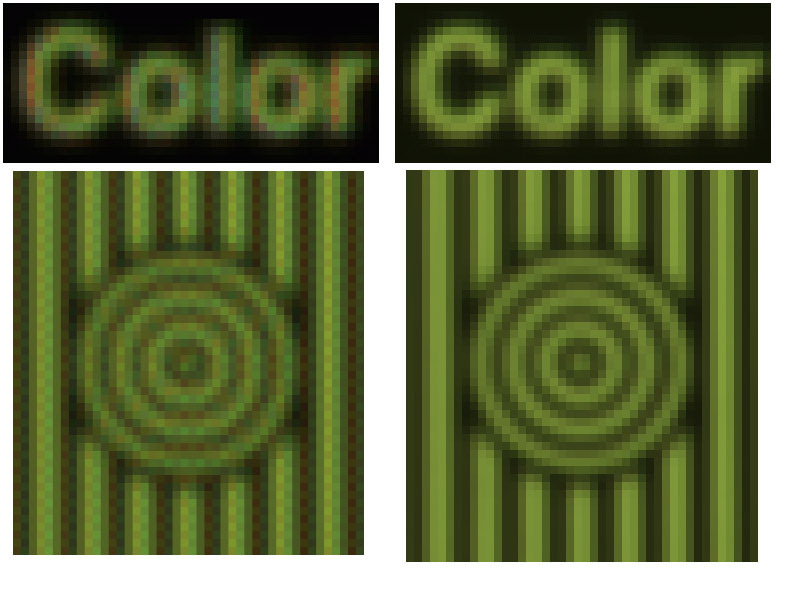 The right panel shows the basic rendering (top) and the illuminant-based rendering (bottom) when parameter alpha is set to one. Hyperspectral data available at: http://color.psych.upenn.edu/hyperspectral.